Ahmedabad Smash Masters and Bengaluru Blasters will leave no stone unturned when they take on each other in the second semi-final of the 2018 PBL. The winner of the match will take on an in-form Hyderabad Hunters, who beat Delhi Dashers in the semi-finals yesterday, in the final of the league. The Smash Masters entered the knockout stages of their maiden PBL campaign after a holistic display by the side saw almost every player perform brilliantly as they won four of the five matches in their last tie against Mumbai Rockets. Though their flawless evening ended with the men’s doubles defeat, the tie was already decided by then. On the other hand, Bengaluru Blasters have been led brilliantly by current World No.1 Viktor Axelsen and despite their loss at the hands of the first finalist Hyderabad Hunters, the Sachin Tendulkar-owned franchise will surely be a big threat for the debutants. Had this been August-September 2017, No one would have given HS Prannoy a chance. But Prannoy of now is a vastly improved shuttler and given the fighting nature of Viktor Axelsen, it is a game worth watching. While Prannoy has scampered home in four of his five matches, the Dane has been the fulcrum for the Bengaluru franchise and has won all four matches he has played this season. The only time, he didn’t play was the last league game against Hunters and the result was there for all to see. Prannoy, though, has the ability to come up with something different and also the history suggests that once Axelsen gets dominated, he struggles to stage a comeback. Nothing can be a better plan than to dominate the World No.1 from the outset for the Smash Masters' hero this season. Sourabh, who has been hot and cold in this season of the PBL, has come back to form by beating Frenchman Brice Leverdez in three games and then his younger sibling Sameer Verma in the next match. Sourabh has looked uncharacteristically calm in his defense this season and negates the opposition smashes with sublime ease. His opponent, World No. 45 Chong Wei Feng has not been that brilliant this season. While he has secured only two wins from four matches, he had to break a lot of sweat for the two wins and a little margin of error against Sourabh will be very difficult for the two-time China Open semifinalist to handle. Tai has been enjoying the form of her life, but her applecart was stopped by a determined PV Sindhu who pushed her out of her comfort zone and that resulted in the former missing from positions where she usually is at her deceptive best and that gave way to numerous unforced errors. Against Beiwen Zhang, Tai was not at his best and it was only because of Zhang’s lack of innovation, she scampered through. However, the Scottish Open Grand Prix champion Glimour is not supposed to pose a huge challenge for the World No.1 in the semifinals. The Ahmedabad Smash Masters duo looked very comfortable against Chennai Smashers and Mumbai Rockets with Nandagopal showing glimpses of brilliance in close rallies. He was also helped by Reginald’s exceptional play at the backcourt and if the duo can do away with the minor chinks that haunted them on some of the points in the matches, they will be a huge task for Bengaluru’s duo of Mathias Boe and Kim Sa Rang, who have lost their two matches from a total of four matches together. World No. 2 men’s doubles exponent, Mathias Boe, though, knows how to tame the opponents and the Smash Masters duo should know it better. The Smash Masters’ duo, despite being doubles specialist, couldn’t match up to their lofty reputations and went down to Chennai’s stop-gap arrangement of P.V. Sindhu and B. Sumeeth Reddy. 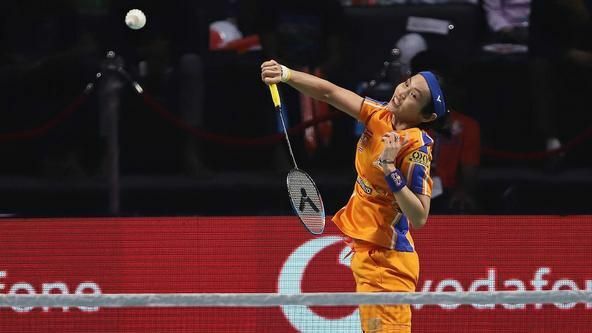 However, in the next match, against Mumbai, the duo had divided the court to perfection, which led to their unshakeable defense that even an experienced doubles pair of Lee Yong Dae and Gabriela Stoeva were finding tough to penetrate. The duo now will take on the mixed doubles partnership of Sikki and Kim. The Syed Modi International champion has already established herself as India’s No. 1 mixed doubles player and will be helped by the former Asia Championships Gold medalist from South Korea, Kim. You can also follow the game here.